This was recorded live from a Cine Ink event. Poet and psychoanalyst, Salman Akhtar is in conversation with Saif Mahmood, author of ‘Beloved Delhi: A Mughal City and Her Greatest Poets’. Salman Akhtar recites his poetry and also shares a slice of his personal life in Urdu and English. Enriching, lyrical, psychoanalytical and funny, the conversation will leave you wanting more. Caution: In one or two places, the conversation contains strong language. This programme was recorded at the book launch of ‘Band Gali Ka Makan’- a new collection of ghazals and nazms- by Salman Akhtar at the India International Centre in New Delhi on 28th January, 2019. Salman Akhtar is a distinguished psychoanalyst, poet, and writer living in the USA. He is the author/editor of 96 books, including eleven collections of poems: Ku-ba-ku (1976), Doosra Ghar (1986), Nadi ke pas (2004), Ghazal @ Englishjunction (2011), Soch Samajh (2015), and Teesra Shahr (2017) in Urdu, and The Hidden Knot (1985), Conditions (1993), Turned to Light (1998), After Landing (2014), Blood and Ink (2016), and Freshness of the Child (2018) in English. For his distinguished contributions to psychoanalysis, he received the prestigious Sigourney Award in 2012. Currently, he holds the rank of Professor of Psychiatry at Thomas Jefferson University in Philadelphia, and Supervising and Training Analyst at the Psychoanalytic Center of Philadelphia. 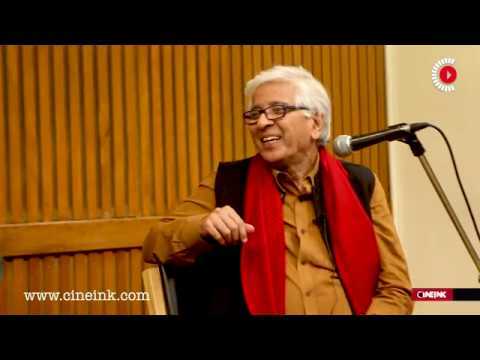 Cine Ink presented an evening of poetry with Salman Akhtar on 28 January, 2019, at India International Centre, New Delhi, and launched two books of poetry by him ‘Symptoms Of Belonging’ (English poems) and ‘Bund Gali Ka Makaan’ (Urdu/Hindi poems). The author of Fractals, EroText and The HarperCollins Book of Indian Poetry, Sudeep Sen was in conversation with Salman Akhtar, discussing Salman’s poetry in English. The author of Beloved Delhi: A Mughal City and Her Greatest Poets, Saif Mahmood had another session of conversation with Salman Akhtar about his poetry in Urdu. Amar Nath Varma, Founder and MD, Star Publications, fondly remembered his association with publishing some of the legends of Urdu poetry such as Sahir Ludhianvi, Jan Nisar Akhtar and Kaifi Azmi. He has published Salman Akhtar’s books of Urdu poetry. Cine Ink released an album of Salman Akhtar’s ghazals on CD, Saaf Keh Do, sung by Nasser Harvani, a Delhi-based ghazal singer of amazing talent.